As per the provisions of section 148(2) of the Companies Act 2013 If the Central Government is of the opinion, that it is necessary to do so, it may, by order, direct that the audit of cost records of class of companies, which are covered under section 148(1) and which have a net worth of such amount as may be prescribed or a turnover of such amount as may be prescribed, shall be conducted in the manner specified in the order. 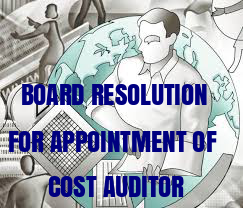 The audit shall be conducted by a Cost Accountant in practice who shall be appointed by the Board on such remuneration as may be determined by the members in such manner as may be prescribed. RESOLVED THAT in accordance with the provisions of section 148 of the Companies Act, 2013 read with Rule 14 of the Companies (Audit and Auditors) Rules, 2014 and The Companies(Cost Records and Audit) Rules, 2014 and other applicable provisions, if any, the consent of the board be and is hereby accorded to appoint __________ as the Cost Auditor for auditing the cost accounting records of the company for the financial year ______ on a remuneration of Rs.___________ per annum plus applicable service tax and out of pocket expenses that may be incurred which is subject to the ratification by the members at the ensuing general meeting of the company.